Cut a large pear shape into a puff pastry sheet to create Santa's face. Brush the dough with a mixture of melted butter and chopped garlic. 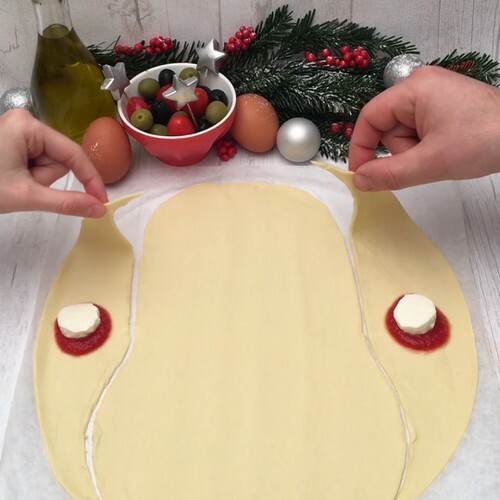 With the excess dough, form 2 balls stuffed with tomato sauce and mozzarella: one for the pompom of his hat, the other for the nose. Add grated mozzarella onto a second sheet of dough and fold it in 2. Arrange it on the bottom of Santa's face, then cut thin strips to create a beard and twists them. With the last puff pastry sheet, create a rectangle of about 2x15 cm which will go as Santa's hat. Then form a second rectangle of approximately 5x15 cm and cut thin horizontal bands on each side; place it on top of the beard, then twist the small strips to create Santa's mustache. Fold the top of Santa's hat down on one side, and put the pre-made pompon ball on the end of it, and brush the hat with an egg yolk and red food dye mixture. Add the second ball for the nose and brush the remaining Santa with egg yolk. Add the olives to create the eyes, and bake for 20 minutes at 180°C. Enjoy warm at Christmas!